The “paper” referenced above from PublicKnowledge.org is an absolutely fascinating read for anyone looking to be the go-to guru of 3D printing and copyright/privacy issues around the office or at the pub. As 3D printing and modeling grow in popularity, it is likely that we will see more companies and individuals assuming they have a copyright for a design or object and demanding removal of unauthorized versions. While most modern songs, movies, and pictures are protected by copyright, the same cannot be said for physical objects. For that reason, when a site receives a takedown request it may be wise to at least consider if the object is protected by copyright in the first place. 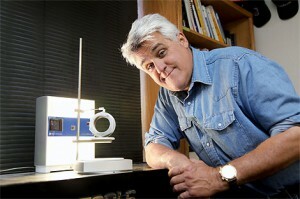 Jay Leno with a 3D printed 1907 White Steamer feedwater heater. This begs the next question for us: Will 3D printers evolve to the point where we never have to purchase “useful objects” from the store again? Will the investment in one sophisticated 3D printer and a site like Thingiverse dispatch with the need to buy screws, keys, auto parts, office supplies or any other physical item again? We don’t know, but we can say with some degree of sureness that if a 3D printing modeler figures out how to make tools more cheaply than say Craftsman or Snap-On, there’s going to be a lawsuit. In the meantime, we’re just excited at the amazing show that’s about to unfold in the 3D Printing universe. « A Valentine’s Day to Remember: For Everybody!